Don't let your pet leave home without one! Dog tags (pet tags) are a must. No matter how well trained your dog is there will be times when he goes out of sight, even if only for a few seconds. You can buy pet tags in many shapes and sizes. From simple discs with your dogs name and your telephone number through ones that flash in the dark to electronic dog tags which give your full contact details including email address and, if required, any medical information. If you've ever lost your dog even for a few minutes you will know how easy it is to do and recognize that horrible feeling in your stomach when it happens. One minute he is fetching the ball for the 100th time then next he picks up a sent and disappears off into the bushes. More often than not after some frantic calling he appears with that quizzical look asking "what all the fuss is about" and all is well. But, one day the unthinkable may happen and he disappears. There are approximately 60 million dogs in the U.S.
More than 8-10,000,000 end up in shelters every year. Out of every 100 dogs in shelters only 17 are ever reunited with their owners. 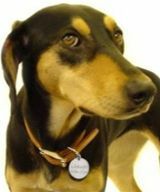 Most of the dogs that cannot be reunited with their owners are not wearing dog tags or the information is out of date. Your pet's safety is top priority to you, so make sure they wear their ID tags. Up to five lines, 24 letters per line. Please provide your name, address, and a phone number. Make a patriotic statement with motion-activated, multi-colored flashing LED lights that can be seen up to one mile away.